The way the world works is changing, thanks in part to the evolution of the gig economy. The term is defined by the Bureau of Labor Statistics as a means to earn an income through single projects or tasks for which an individual is hired on a temporary basis to perform. The influx of digital marketplaces that connect companies seeking temporary contract workers with those willing to take on temporary contract work has created a new workforce that encompasses an estimated 162 million people within the United States and Europe alone. Also, companies have embraced the role of freelance workers in their business models and marketed to individuals looking for a different method of earning an income or those wishing to supplement earnings from a conventional employer. Individuals who take on freelance or contract work have flexibility not afforded to employees who work a traditional nine-to-five career. Gigs can be accepted at any time, from any location, and in some instances, the worker has the advantage of setting his or her own rates for the task being performed. And anyone can join the gig economy on a full- or part-time basis, based on their abilities. Skills like graphic design, content development, data entry, and even computer programming can be marketed to and utilized by willing buyers, on demand. Although there are several advantages to creating a lifestyle from opportunities in the gig economy, individuals face unique challenges that traditional employees do not. One of the most pressing obstacles revolves around personal financial wellness. Employees who work a conventional job, whether full- or part-time, often have access to valuable benefits that individuals who work on a contract-by-contract basis are not afforded. A lack of benefits, many of which require nothing more than a check in a box when starting as an employee of a company, causes undue stress among workers in the gig economy. Health insurance, for example, is the sole responsibility of the freelance worker. When subsidies from an employer or discounts provided under a group health insurance plan are not available, the process and cost for obtaining coverage can be prohibitive. Contract workers in the gig economy also lose access to streamlined retirement benefits, such as a 401(k) or another employer-sponsored retirement plan. While not all retirement savings vehicles offer matching contributions directly from the employer’s coffers, the ability to establish paycheck deferrals is an easy way to set aside for the long-term goal of retirement. Contract workers have access to several retirement plans, including a single 401(k), a traditional or ROTH IRA, or a SEP IRA. However, the creation, implementation, and monitoring of each plan requires some degree of knowledge on behalf of the contract worker, not to mention dedication to making contributions independent of paycheck deferrals. Budgeting is also a major financial wellness pitfall for workers in the gig economy. The flexibility afforded to individuals who work as contractors or freelancers is invaluable, but it often means income ebbs and flows based on the amount of work taken on during a given month. It is not often steady, and there is no guarantee that a contract in place the previous month will be intact for the current month. Without a steady paycheck deposited every two weeks, gig economy workers often find it difficult to manage living expenses and unexpected bills with as much ease as a conventional employee. Building emergency savings, accounting for taxes, and being able to show proof of income for lending purposes are also common burdens freelance and contract workers carry. Each of the financial wellness issues plaguing freelance and contract workers in the gig economy is a challenge to overcome alone, but having a foundation of basic financial knowledge through financial wellness can make a world of difference. Companies that hire workers from the gig economy on a contract basis can lend a hand by making the same financial literacy resources that are available to conventional employees easily accessible to contract workers, too. 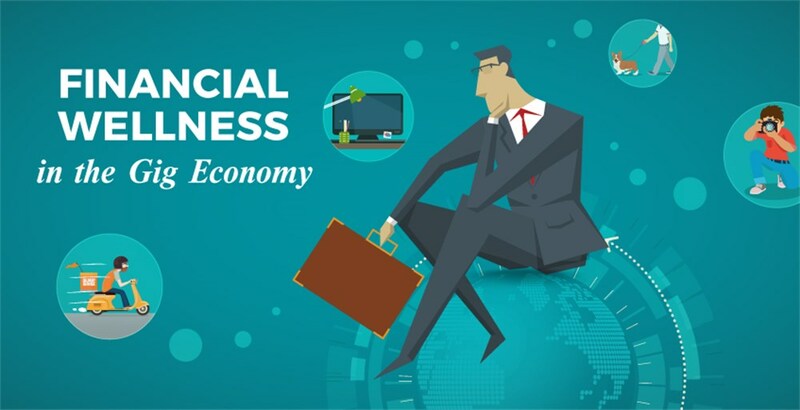 Resources may include educational information about methods to save for retirement, how to create a budget and stick with it, or considerations for taking on and paying down debt, all which are just as beneficial to gig economy workers as they are traditional employees. Similarly, the digital marketplaces that connect businesses and individuals with contractors and freelancers can offer assistance through webinars, online articles, or a connection with a financial coach or mentor. Businesses that rely solely on non-employee workers have an opportunity to educate their workforce through similar methods, fueled by a financial wellness program that focuses on contract workers’ unique needs. By taking on part of the responsibility for improving the financial literacy levels of nontraditional workers, companies, marketplaces, and the individuals who hire contractors can ensure the gig economy will be a viable source of income for millions of people both now and well into the future.